On Saturday afternoon we went to a reading and exhibition by Pierre Joris & Nicole Peyrafitte, in Luxembourg. It was on all three floors of Gallery Simonis. When I first got there, I saw the paintings hanging, and my basic reaction was “they must have been fun to make”. They are splotches, broad lines, drawn on a large role of paper, full of movement with the colour of good humour. No obvious form was visible to me, beyond a feeling of the 1950s revolutionary experimentation, jazz, the free artist in the city–centre attic. Little did I know…! The performance opening with some singing by Peryafitte. She was singing in French—there might have been some Occitan, although that might have been a mixture of erudite French and my linguistic ignorance. She has a fine voice. Then things got interesting. 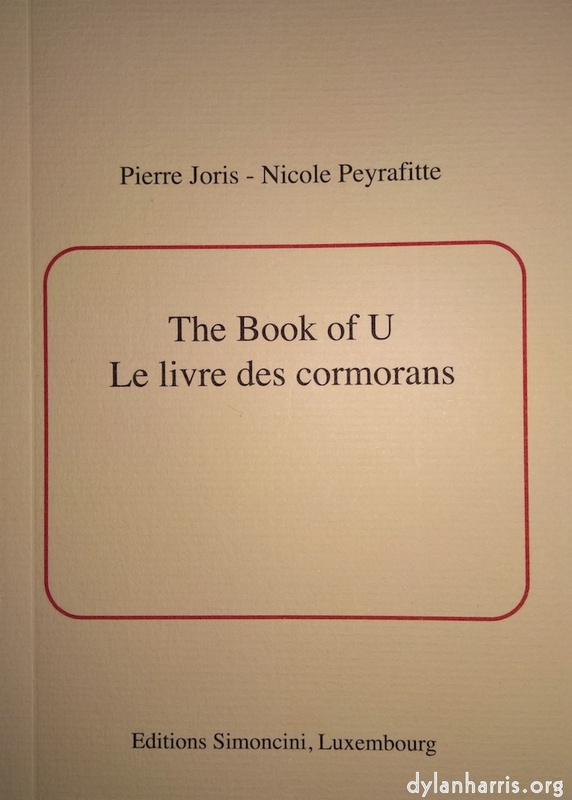 The book’s title is The Book of U / Le livre des cormorans. These are not mutual translations, unless you are a cormorant. Well, actually, it turns out they are mutual translations. You see, things got interesting, not because the preceding singing wasn’t interesting (it was), but because Peyrafitte was replaced by a cormorant who looked exactly like her. The bird squawked and her parent, who looked oddly like Joris, fed her black charcoal, then got on with the reading. The bird chewed the charcoal, and spat charcoal powder, charcoal grits, charcoal chunks, onto the paper, where some stuck and greyed. Cormorants, as I’m sure most people know, do not have arms, so it’s not really surprising that the bird had to paint with her feet. The paper, more than six feet of it, was hanging on the wall. The bird grabbed various coloured charcoal sticks—with her feet—and drew. She drew by handstand, facing the audience with the paper behind her. She drew by lying on her back, her feet above her head, on the paper. She drew by slow–motion jujitsu. Sometimes she’d get up, eat more delicious charcoal, spit on the developing form, and return to her difficult, inverted footwork. Unfortunately, the performance was so dominant that I failed to properly listen to the poetry. This is partially why I bought the book. It’s Joris’s English language poetry translated by Peyrafitte into French, along with her gorgeous and simple monochrome painting of a moment’s sight of a flying, triumphant cormorant. … it’s totally worth a rainy Sunday afternoon read. The exhibition took three floors of the gallery. Upstairs was Peyrafitte’s attic studio. I didn’t take proper time to look at her work, mostly because I spent rather too much time talking with her. When I ran Poets Live in Paris, both Peyrafitte and Joris read there. Downstairs was Joris’s poetry den, exhibiting his books. On the walls were a few quotes of his poems, and my God is he good. One section showed an extract from his poem Turbulence. I have to find it. It’s from a collection published in 1991 which, of course, is no longer available. Near it on the wall was a letter to Bob Cobbing, the sound poet, who ran the Writer’s Forum in London until his death. By the letter was the sound poem, a long piece that ascended the wall to the glass ceiling above. Standing on that floor above was a young lady dressed in a winter skirt. I still have enough of my 13 year old self to be distracted from the poem. Oh dear. Around them were copies of his early chapbooks, and magazines that published him. They are very samizdat: stapled unfolded A4. I now understand why Kit Fryatt, when we ran wurm & made the wurm chapbooks, referenced hand–made products like these with their brilliant content. I’d picked up the wrong reference, the punk fanzines of my youth. Still, both are associated with revolution in their art, so perhaps I wasn’t really that wrong. This book, though, is beautifully presented, as is the norm for Luxembourg publications.